to Kevin Kolb. Case was no different except he had a much steeper road to climb to be accepted amongst his peers at the pro level. After leaving the NCAA behind as the career yardage leader with 19,217 yards and a bevy of other records- he went unselected in the 2012 NFL Draft. Teams had grown weary of products from UH and were not enthusiastic about Keenum’s size or injury history. After the draft he signed a free agent contract with the Houston Texans. He spent the entire 2012 season on the team’s practice squad. The Texans were on the verge of one of the most terrible years in the history of the franchise. In 2013, Houston came out of the gate firing on all cylinders at 2-0, then dropped the remaining 14 games in a row. During that period, QB Matt Schaub came apart and was benched for TJ Yates who was ineffective, opening the door for Keenum to show his stuff. He was still really a rookie, but Case showed some promise, and had a cannon for an arm. Despite his efforts, the Texans did not win a game with him at the helm. Case finished with 9 TDs to 6 INT, on 137 of 253 passes, and 1,760 yards. The Texans cleaned house after the season and Gary Kubiak‘s staff was disassembled. Case was released and signed by the Rams. 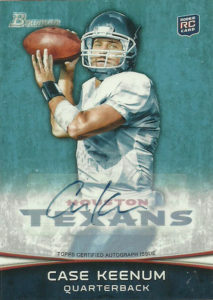 Again Case bade his time on the practice squad, but as fate would have it, he’d take another turn as quarterback of the Texans. He’d be resigned by the Texans late in the season and guide the team two two wins, over Baltimore and Jacksonville, helping the Texans finish with a 9-7 record in rookie head coach Bill O’Brien’s first year. Keenum was traded back to the Rams the next year and in mid-November replaced starter Nick Foles as starting quarterback of the Rams, and into the team’s transition back to Los Angeles in 2016. During that off season the Rams were looking to make a splash in the NFL Draft to show fans in LA they were serious about winning. The team traded up and selected QB Jared Goff #1 overall. -The writing was on the wall for Case. He’d hold down the starting job through mid-November before being benched in favor of Goff. Case signed a free agent contract with the Minnesota Vikings for 2017. Largely an afterthought in the QB derby that was the Vikings, Sam Bradford was holding down the job provided Teddy Bridgewater could return from a catastrophic injury. Case entered the 2017 season as Bradford’s backup. After Bradford was injured during the season opener, Case stepped up and led the team the rest of the way through. As a passer he had the best season of his career throwing for 3547 yards on 325 completions (481 attempts), and 22 touchdowns to just 7 interceptions, while posting an 11-3 record as a starter and to the playoffs. The Vikings were impressed, but Case jumped ship to the Denver Broncos in 2018 where he is expected to bring stability to the position for the franchise. As Case continues to mature, he reminds me of a young Drew Brees coming into his prime- but maybe that is all hyperbole. Case Keenum is another patient exercise in finding good value off of EBay. After failing on him inexplicably back in 2013, I had been spying his cards for quite a while trying to find a good value pickup. I always felt like Keenum had what it took, and when the Texans traded him away, I was particularly miffed. When it appeared that the dust had settled after his stint in St. Louis I was able to get this card for like a buck or two off of EBay. Now this particular card is treading water at 6-9 bucks.